Stills from the film “A Day in the Life...” screened at the ICRISAT Gender Forum launch. 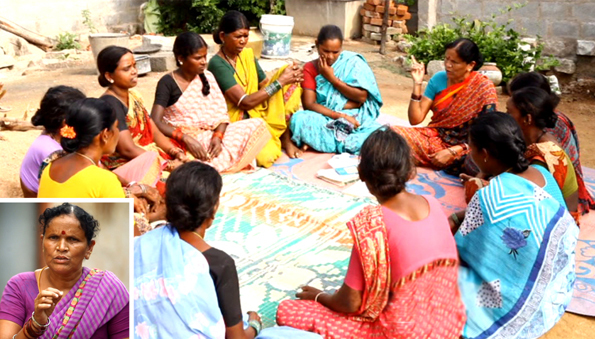 Yadamma (inset) leading a self-help group meeting. The Forum seeks to move away from the current ‘Women in Development’ approach and focus on the inequitable power relation between genders. As part of ICRISAT’s commitment towards integrating a gender transformative approach in agricultural research, the ICRISAT Gender Forum was launched. The Forum seeks to integrate gender in agricultural research leading to more effective development outcomes and impacts. The Forum would focus on understanding how gendered power relations result in inclusion or exclusion and move from a ‘Women in Development’ approach to a “Gender and Development’ approach and finally to a transformative approach which involves refocussing on power relations that sustain inequity. In his message, ICRISAT Director General Dr William D Dar stressed on the critical need to make agricultural practices and research more gender inclusive for more equitable distribution of benefits (from agriculture) among marginalized groups such as women agriculturalists and smallholder farmers. Citing the example of SEWA (Self Employed Women’s Association) and drawing cues from their work, Dr Dar mentioned how rural women have today become “the face and focus of our work at ICRISAT as changing migration and employment trends have diminished differences among categorizations of smallholder farmers and women involved in agriculture”. He further elaborated on the emerging role of women as ‘community change agents’, and women centric programs as conduits for effective change towards equitable power and gender relations. Dr Cynthia Bantilan, Research Program Director, Markets, Institutions and Policies, ICRISAT, highlighted the importance of such an initiative in the context of ongoing research at the institute while introducing the recently appointed regional ICRISAT gender specialists Dr Wenda Bauchspies for CGIAR Research Program on Dryland Cereals based in West and Central Africa (WCA); Dr Esther Njunga-Mungai for CGIAR Research Program on Grain Legumes based in Eastern and Southern Africa (ESA); and Dr R Padmaja for MIP based in South Asia. Drs Shoba Sivasankar, Director, CGIAR Research Program on Dryland Cereals and Noel Ellis, Director, CGIAR Research Program on Grain Legumes, briefly talked about how gender research priorities were being integrated into the programs and product lines of the respective CGIAR Research Programs. Dr R Padmaja representing the ICRISAT component of the CGIAR Research Program on Policies, Institutions and Markets explained how strategic gender research is expected to translate into larger development outcomes such as food security, nutrition and improved health, increased income and gender equity across the CGIAR Research Programs. The highlight of the event was the screening of a short documentary film entitled, “A Day in the Life…” which portrayed the societal complexities and challenges faced by rural women in agriculture. The film is an inspiring story of one such woman, Yadamma from Aurepalle village in India, who managed to break out of this cycle of intergenerational poverty. Yadamma has been part of the Village Level Studies, and her life has been documented as part of the project surveys, since 1975. The project is currently funded by the Bill & Melinda Gates Foundation. The film, which was screened at the International Women’s Film Festival held earlier this year in Hyderabad, was introduced by Ms Joanna Kane-Potaka, Director, Strategic Marketing and Communication. She noted the importance of communicating success stories that focus on the whole story, not just the good parts, and can tell the farmer’s story and not just the institute’s story, which this video aimed to achieve. 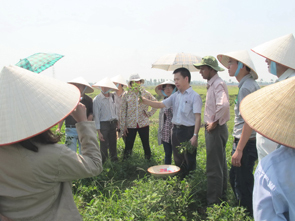 The next ICRISAT Gender Forum event is scheduled to be held in July in either WCA or ESA. The Gender Forum was formally launched on 26 May by ICRISAT Director General Dr William D Dar. In addition to staff who took part in the event at the headquarters, ICRISAT gender specialists and the scientists and staff in WCA and ESA joined in virtually through KSIConnect. 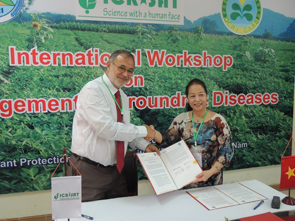 ICRISAT and Nepal’s fruitful partnership in research for development (R4D) efforts has increased productivity and production of grain legumes, improving income, food and nutrition of smallholder farmers in Nepal. Significant achievements of this current partnership include: release of 16 improved cultivars of grain legumes (8 chickpea, 6 groundnut and 2 pigeonpea) in Nepal, identification of farmer-preferred cultivars through farmer-participatory varietal selection trials, refinement and promotion of integrated crop management (ICM) practices for grain legumes, development of community-based and village level seed systems and knowledge empowerment of researchers, extension personnel and farmers. 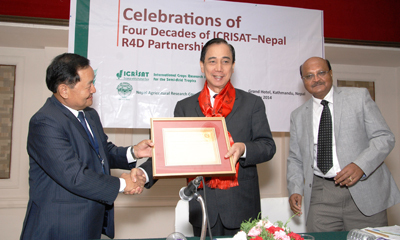 “Four decades of ICRISAT-Nepal R4D partnerships on grain legumes” was celebrated in Kathmandu, Nepal on 21 May. 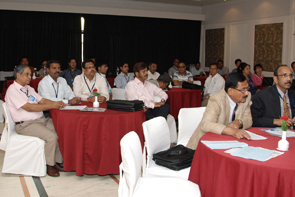 The program was jointly organized by ICRISAT and the Nepal Agricultural Research Council (NARC). 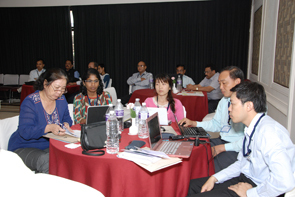 It was co-chaired by Dr William Dar, Director General, ICRISAT and Dr Dil Bahadur Gurung, Executive Director, NARC. Dr Dar in his address emphasized on the role of partnerships in improving livelihoods of smallholder farmers using the power of science and technology. He added that, ICRISAT would support the work of NARC with a vision to double the productivity of smallholder farmers in Nepal. Dr Gurung appreciated the support of ICRISAT, especially in supply of germplasm and improved breeding materials, support in promoting adoption of improved cultivars and integrated crop management (ICM) practices in Nepal and training of NARC researchers at ICRISAT. He also requested ICRISAT’s support to Nepal in emerging areas of Biotechnology and Information Technology. Dr YG Khadka, Director, Crops and Horticulture Sciences, NARC welcomed the participants at the event. Dr CLL Gowda, Deputy Director General-Research, who had a long association with the National Grain Legumes Research Program (NGLRP), particularly as Coordinator of Cereals Legumes Asia Network (CLAN), gave a historical perspective of the partnership that began in 1975 and presented some achievements. There were several ICRISAT-Nepal collaborative projects in Nepal for which the financial support came from various sources such as the Asian Development Bank (ADB), Department for International Development (DFID), and Australian Centre for International Agricultural Research (ACIAR) and the International Fund for Agricultural Development (IFAD). At the event, Dr Dar was honored by Dr DB Gurung, for his continuous efforts to strengthen the ICRISAT-Nepal partnerships. Other research managers and scientists from ICRISAT honored by NARC for their significant contributions in grain legumes R4D activities in Nepal included Drs CLL Gowda; Rajeev Varshney, Research Program Director-Grain Legumes; Pooran Gaur, Assistant Research Program Director-Grain Legumes; HD Upadhyaya, Head-Gene Bank; and GV Ranga Rao, Special Project Scientist. Dr DB Gurung was presented a plaque of honor by Dr Dar for his strong support in pushing ICRISAT-Nepal partnership to greater heights. Under his leadership, the IFAD-supported project on ‘Sustainable Management of Crop-based Production Systems for Raising Agricultural Productivity in Rainfed Asia’ made excellent progress in Nepal. Seven eminent scientists, Drs Maheshwar P Bharati, Ram Pratap Sah, Bharatendu Mishra, NS Jodha, Ram Krishna Neupane, Yagya Prasad Giri and Nawal Kishor Yadav, who significantly contributed to the development and promotion of the ICRISAT-Nepal partnership for R4D in grain legumes in Nepal, were also recognized. Dr MP Bharati was instrumental in the establishment of the NGLRP in Nepal and was the first Country Coordinator for legumes in Nepal. Drs MP Bharati and RP Sah were also Executive Directors of NARC and contributed significantly to enhance the R4D partnership in Nepal. 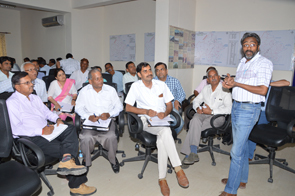 ICRISAT staff finalizing interventions with participation from farmers. In order to boost the resilience of dryland systems, strategies such as rainwater harvesting for high-value crops, development of agro-forestry-horti systems , and village-level seed production were identified as priority interventions in Rajasthan, India. At a workshop organized by ICRISAT and its partners Gramin Vikas Vigyan Samiti and the Central Arid Zone Research Institute (CAZRI) on 22 May at the CAZRI headquarters, participants deliberated on issues related to enhancing dryland farming in the region and potential strategies for achieving convergence among major stakeholders. The interventions and convergence are proposed to be taken up under the Local Innovation Platform for Western Rajasthan. 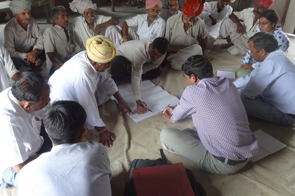 This platform is part of the CGIAR Research Program on Dryland Systems work in South Asia where ICRISAT is operational in eight action sites in Jaisalmer, Jodhpur and Barmer districts of the state. Dr MM Roy, Director, CAZRI, in his inaugural address appreciated the concept of the innovation platform, which would act as a hub for stimulating technical and institutional innovation for dryland system intensification and resilience building. He also highlighted the on-ground interventions of the CGIAR Research Program on Dryland Systems. Sessions at the workshop were chaired by Directors of CAZRI, Arid Forest Research Institute (AFRI) and Indian Council of Agricultural Research (ICAR) Zone-VI. Participants identified key elements to be considered for institutionalizing common property resource management such as community pastures and community rainwater harvesting structures. Participants stressed that the planning horizon of such programs (CGIAR Research Programs) should be at least three years to enjoy effective partnerships and outcomes and provided feedback on improving the future implementation of the program. The stakeholders represented a cross-section of institutions such as CGIAR partner institutes; National Agricultural Research Systems; various State Departments; Krishi Vigyan Kendras (KVKs) and local non-governmental organizations. Drs Shalander Kumar and T Ramilan from ICRISAT facilitated this event. Drought forecasting and drought adaptation and mitigating strategies for the target regions are important components of the IFAD project. Sessions on Drought forecasting and ICT tools were conducted during which Drs AVR Kesava Rao and G Murali Krishna from Research Program - Resilient Dryland Systems, ICRISAT made presentations on ‘Drought characterization, monitoring, and forecasting using climate data’ and ‘Remote Sensing Application in Agriculture’ respectively. To elucidate the concept of IMOD, Dr M Srinivas Rao, Markets, Institutions and Policies, made a brief presentation and helped participants include the IMOD strategy in the work plan. 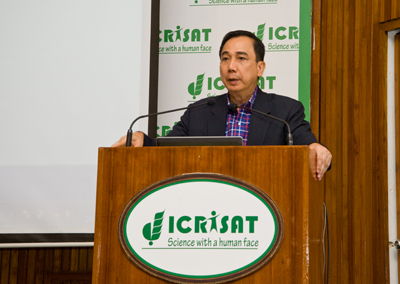 At the opening ceremony of the workshop, ICRISAT’s Dr Farid Waliyar, former Director for West and Central Africa, reiterated the importance of groundnut as a major protein source in Asia and sub-Saharan Africa. Further, he explained the role of major biotic constraints, including aflatoxin contamination, in hampering groundnut productivity worldwide.